ETX (“ Embedded Technology eXtended”), is an integrated and compact 95 × 125 mm (3.7 × 4.9 in) computer-on-module (COM) form factor, which can be used in a design application much like an integrated circuit component. 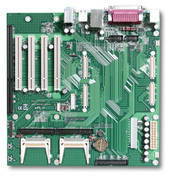 Each ETX COM integrates core CPU and memory functionality, the common I/O of a PC/AT (serial, parallel, etc. ), USB, audio, graphics, and Ethernet. All I/O signals as well as a full implementation of ISA and PCI buses are mapped to four high-density, low-profile connectors on the bottom side of the module.